Vit’i5 Little Ca:P=3 is a complementary supplement containing vitamins and minerals. It has been especially adapted for puppies and kittens that are fed homemade diets. Also suitable for pregnant or lactating females, and healthy dogs and cats up to 8 years of age. What is Vit’i5 Little Ca:P=3? 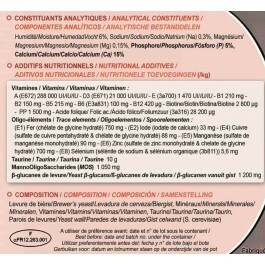 Vit’i5 Little Ca:P=3 is a complementary supplement containing vitamins and minerals. 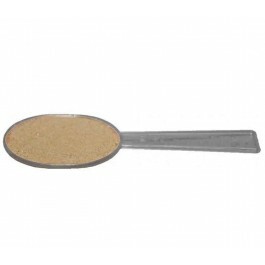 It has been especially adapted for dogs and cats that are fed homemade diets. 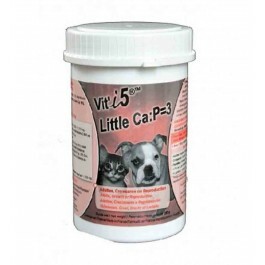 Little Ca:P=3 is formulated for puppies and kittens. Also suitable for pregnant or lactating females, and healthy dogs and cats up to 8 years of age. - Dogs and cats that are fed homemade diets. - Healthy cats and small-medium sized dogs up to 8 years of age. What are the benefits of using Vit’i5 Little Ca:P=3? What is in Vit’i5 Little Ca:P=3? Composition:Brewer’s Yeast, Minerals, Vitamins, Taurine, Yeast wall. Analytical Constituents: Ash: 48% - Protein: 21% - Calcium: 15% - Moisture: 6% - Phosphorus: 5% - Fat: 1% - Fibre <0.5% - Sodium: 0.3% - Magnesium: 0.15%. Nutritional Additives:Vitamin A: 288,000IU - D3: 21,000IU - E: 1.470IU - B1: 210mg - B2: 150mg - B5: 215mg - B6: 100mg - B12: 420µg – PP: 1,500mg - Biotine: 2,800µg - Folic acid: 28,200µg. How much Vit’i5 Little Ca:P=3 should I use? Healthy adults: 1 dose Vit’i5 per 4-5kg body weight. * or 1 dose Vit’i5 per 100g meat or fish. Vit’i5 Little Ca is a complementary supplement containing vitamins and minerals. It has been especially adapted for dogs, cats and ferrets that are fed homemade diets, that are aging or suffer from kidney/heart failure or urinary crystals. 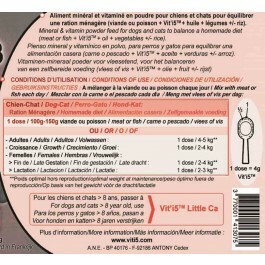 Vit’i5 Canine Ca:P=3 is a complementary supplement containing vitamins and minerals. It has been especially adapted for dogs that are fed homemade diets. Ca:P=3 is formulated for healthy dogs up to 7 years of age. Also suitable for puppies and pregnant or lactating females. Vit’i5 Canine Ca is a complementary supplement containing vitamins and minerals. It has been especially adapted for dogs that are fed homemade diets, that suffer from kidney/heart failure or urinary crystals. Also suitable for healthy dogs up to 7 years.